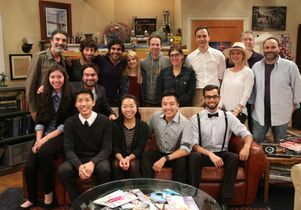 As five UCLA freshmen settled onto a bus Thursday that would return them to campus after an on-set visit with the cast, crew, producers and writers of “The Big Bang Theory” at the Warner Bros. backlot, they bubbled over in amazement. 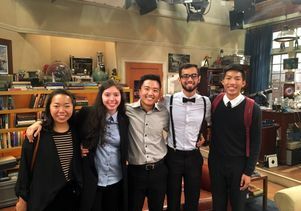 The exuberant freshmen were the latest recipients of scholarships to UCLA from the Big Bang Theory Scholarship Endowment, now in its second year of supporting low-income students who are pursuing degrees in science, technology, engineering and mathematics. They are Mia Shannon Reyes, majoring in aerospace engineering; Mateen Ul Hassan, a physics major; Steven La, a math major; Amy Shao, a neuroscience major like Bialik; and Jonathan Shi Jr., majoring in pre-microbiology, immunology and molecular genetics. Now in its 10th season, the popular sitcom follows the lives of young academic researchers who work in various scientific fields. The endowment has already raised more than $4 million, with an initial donation from the Chuck Lorre Family Foundation and gifts from nearly 50 people associated with the show. 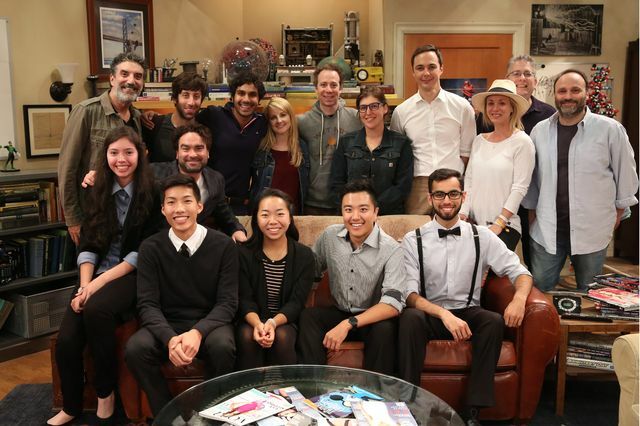 Donations came from all the lead actors, including Bialik, who earned her Ph.D. in neuroscience from UCLA; Johnny Galecki; Jim Parsons; Kaley Cuoco; Simon Helberg; Kunal Nayyar; and Melissa Rauch. Gifts also came from executive producers Bill Prady and Steven Molaro, crew members, Warner Bros. Television, CBS, other corporate partners and UCLA physics professor David Saltzberg, the show’s science consultant since its inception. 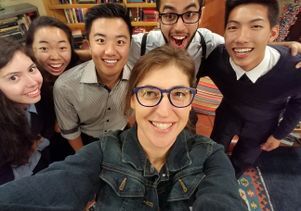 Dozens of the “Big Bang” donors were on hand Thursday with glasses of sparkling apple cider to celebrate the five newest UCLA Big Bang Theory scholars at an on-set reception. The students’ eyes widened as Chuck Lorre, the show’s executive producer and creator, surprised them with boxes wrapped in big red bows. The scholarship will support five new UCLA science students annually. Fifty-two percent of UCLA students receive need-based scholarships, grants or other aid; approximately 39 percent of undergraduates are receiving Pell Grants, federal aid for students from low-income families. Almost one-third of UCLA graduates have parents who didn’t graduate from a four-year college or university. One of this year’s scholars was in that exact position. 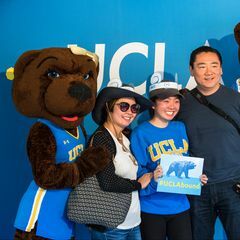 Two days before the deadline to commit to UCLA — her “dream school” — Reyes had had to select a more affordable alternative. Then she got word that she had received the UCLA Big Bang Theory scholarship. Now she’s living on the Westwood campus and majoring in aerospace engineering (the same field as that of the Howard Wolowitz character on the show). When she found out about her scholarship (but not the reception), she tried on her own to attend a taping of the show as a way of saying thank you, but the studio filled up before she could get in. So instead, they gave her a ticket promising her priority seating at a future taping. On Thursday, she proudly showed everyone the ticket to prove she had given it her best shot. “Well, you’re part of the family now,” Lorre said. Reyes smiled and looked almost faint with excitement. All five recalled their amazement, and skepticism, at finding out that the show’s members weren’t just funding their scholarship, but also wanted to meet them. Hassan feared the email was a phishing scam; Reyes, feeling queasy, excitedly called her mom; La asked his friends if they thought the invitation was real. 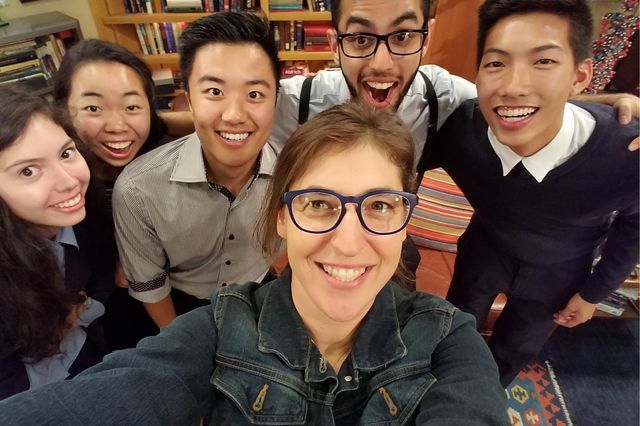 The “Big Bang” scholars pose for a selfie with Mayim Bialik. 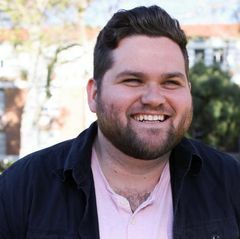 La, who is the first in his family to go to college, connected on the set with Bialik over their shared knowledge of his hometown, San Jose, and their favorite donut shop there. La also got signatures on a coffee mug from everyone, including Galecki, who plays Leonard. That’s the character La said he identifies with the most, although, he added, his friends were more likely to compare him to the nerdier Sheldon, Jim Parson’s character. The students were giddy with excitement when their bus arrived at the studio. “I feel like I’m going to faint a little bit,” Shi said. “As long as someone is more nervous than me,” Reyes replied. They explored the backlot together and bought T-shirts at the Warner Bros. souvenir shop before heading to the rehearsal and the reception. Lorre drifted over to them between scenes. “I’m so excited to meet you all,” he whispered, and offered to move some equipment to improve their view. The students thanked him and played it cool until he walked away. Then, eyes popping, they fanned their hands in excitement. By the time the students boarded their shuttle back to campus, they were almost overcome with joy as they relived their favorite celebrity moments and made arrangements to share photos. 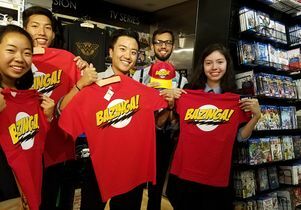 Big Bang scholarship recipients and cast, producers of "The Big Bang Theory"
Five UCLA freshmen show off souvenirs of the show that they purchased at the Warner Bros. store.